When I found out I was expecting Tink, my first child and the first grandchild for my parents, I wanted to announce the big news in grand fashion. An opportunity to meet my parents at Walt Disney World arose and I decided this was my chance and booked a flight. I arrived at Old Key West around lunchtime and spent the rest of the day looking for a clever way to spill the beans. Finally it was almost time for IllumiNations to start and I still hadn’t told them. I called my husband so he’d “be there” too and said I had big news. Of course they were thrilled and I know we all still think of that night when we pass that bench near the World Showcase Lagoon. 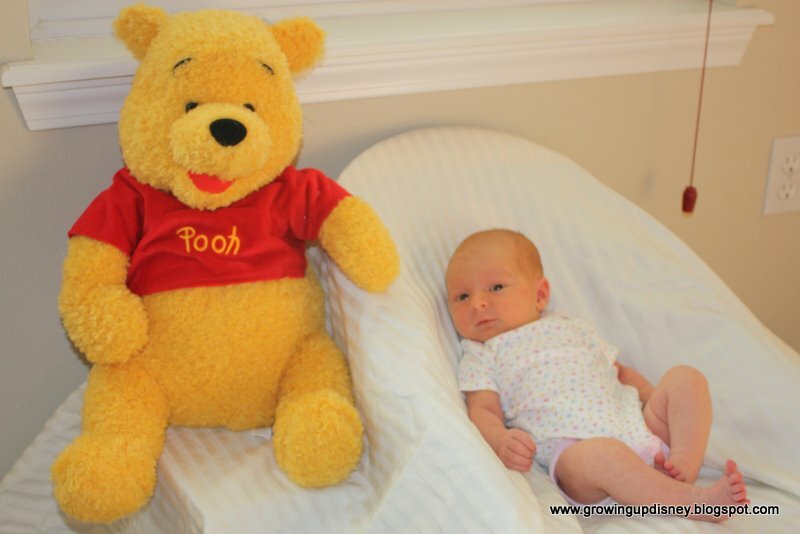 Granddaddy-to-be couldn’t wait to buy the baby his or her first Winnie the Pooh (he’s my favorite.) I had flown with only a big backpack that trip so my mom told my dad he had to wait until we were all back at the World the following month. On that next trip, he then bought a Pooh bear so large that it would be a very long time before the baby was big enough to play with him. This Winnie the Pooh became a growth chart of sorts. 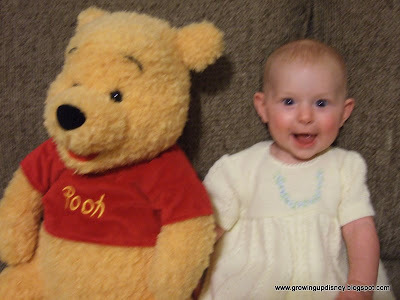 At one week and then each month, I took a picture of Tink sitting next to Pooh. 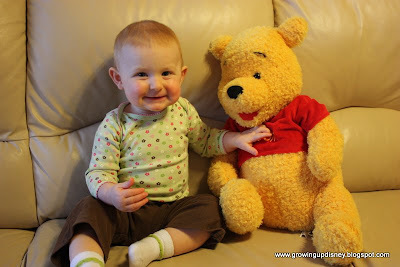 I’d also take Pooh with us if we got professional pictures. When you put all of the photos together, it’s fun to see Tink get larger and more animated in relation to her friend. I used these pictures to begin a photobook I made for my mom of our birthday trip. I will also use them to fill a frame I received from my aunt that has an opening for each month. I’ll continue to take pictures with Pooh as long as Tink lets me. I think we’ll go to quarterly for now. Do you have a “we’re expecting!” story you’d like to share? Have you incorporated your favorite Disney characters into your children’s photos? I’d love to hear from you. What a great story. Maybe we should have waited til we were all in wdw to tell my inlaws but I thought we'd better tell them before we left or they'd be wondering why I wasn't lifting any of the cases and kept going to the loo on the plane lol! It was nice knowing I was pregnant with my Tink at wdw though :) she also has a giant pooh but her favourite is minnie!